I've been looking all over the web. 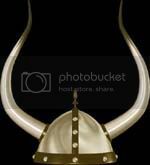 I'm trying to find a Viking baseball cap that has horns printed on the side. Not a Helga Hat, but a baseball cap with the horns down the side like the helmet. Two season back I saw someone with one like it at a game in Charlotte. Decided this year to try and find it for myself for Christmas. Can't find it anywhere. Any suggestions? Maybe somewhere that does custom hats? Found this but it looks like it's an old item. It may help your search.